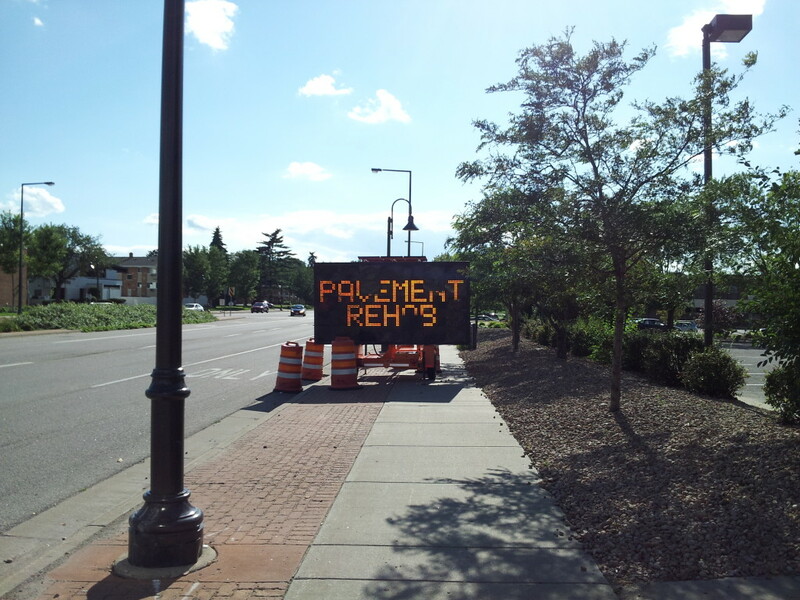 Pavement rehab? Maybe this is what Amy Winehouse sang about. I can tell Mr. Frost did not reside in Minnesota, because during this summer even the road less traveled is under construction with alternate routes having little difference on delays and frustration levels. The harshness and duration of Minnesota winters ensures that the snow free season sees a significant increase in traffic. People living here want to get on the road to enjoy time on or near one of well over 10,000 lakes or several thousand miles of rivers. Annual temperature swings of at least 110°F are common and those extremes in temperature are tough on roads. Excessive salt is not good for man nor beast, and the same is true for roadways. Salt eats away at bridge trusses and road surfaces, which allows water to seep into the paving material through the summer. In some cases, a road literally explodes in hot weather from the trapped water forming high vapor pressure. The major thoroughfares in the metro area need work, and this year the number of projects and their timings are curious. Highway 100 has become the Highway to Hell for people in the western metro. If a major highway is under construction, rest assured that several side streets on either side of it are also ripped up or covered in tar and rock chips. One saying I heard repeatedly in management training and from sports coaches is “Short term pain for long-term gain.” The question getting asked is what is really the gain with some of the projects? The Minnesota State Fair, the Minnesota Renaissance Festival, Valley Fair and Canterbury Downs are either open or will soon open. Shortly thereafter, colleges and universities begin swelling their populations with students, many from out-of-town. Traffic levels increase this time of year, so one would think the road projects would be near completion. This year, one would be sadly mistaken. I have spent a lot of time traveling in Wisconsin, Iowa an South Dakota this summer, and Minnesota has the most road construction underway. The construction is not limited to the Twin Cities metro area. I-35 has about 25 miles of construction zones south from the Twin Cities to I-90. I-90 has about 55 miles of pavement rehab underway. Minnesota 70 has a several mile detour. Sometimes construction begins with no advance warning and local businesses suffer. Smartphone GPS apps and GPS units with live traffic updates are an accessory almost as precious as air conditioning and automatic transmission. Some of the smartphone apps allow for “crowd sourced” updates, meaning a passenger in the vehicle indicates what traffic challenge lies ahead: accident, traffic jam, object on the roadway, or unexpected construction. I can find my way around most of the metro area without needing a map, but I use my GPS app because of traffic. Before visiting the Twin Cities during this endless construction season, pack some snacks, make sure you have good music to help pass the time in traffic jams, and update your GPS device or app before getting in the car. Allow some extra time and enjoy the endless sea of brake lights and orange cones. After all, it’s not the destination, it’s the journey that matters…or so we have been told. The “Journey of the Teal Owl” HOM Teal Strides team is up for 2015. Please join me September 12, 2015 at Rosland Park in Edina. If you can’t make it, you can join as a “sleepwalker”. Donations are tax-deductible, the walk fee is NOT.